4 1-week meal plans with shopping lists, 50 low-FODMAP autoimmune protocol recipes, and resources for further information! One of the biggest challenges to putting the autoimmune protocol into practice is finding the time and energy to cook compliant meals every. single. day. You have to find recipes, make a plan, buy the ingredients, cook the food, and then clean up the kitchen afterwards. And when you throw in additional restrictions like low-FODMAP? Forget about it! 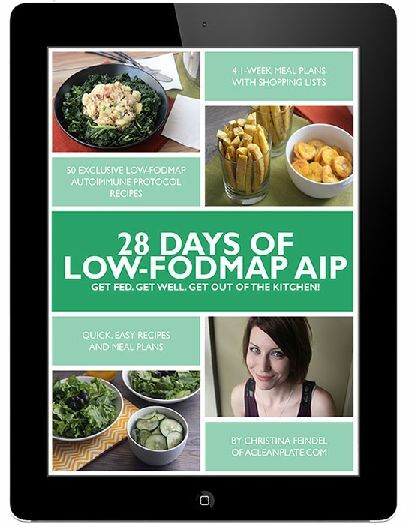 My new low-FODMAP AIP meal plans take the fuss out of finding recipes and utilize a wide variety of easy-to-find ingredients without requiring a lot of time in the kitchen. You can combine the plan with recipes you like or want to try from elsewhere, make double batches so that you have even more leftovers for easy meals down the road, and - best of all - spend less time in the kitchen so that you can get back out there and live your life.